Click the button to see the Havanese puppies! Puppies! A Havanese is truly a wonderful dog. home and are first and foremost beloved family pets. They are quite sturdy for a toy breed. This helps them hold up to the fun and play with the children in the family. 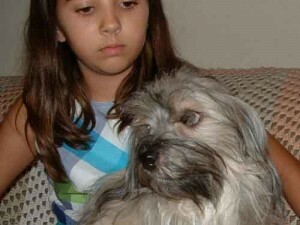 Havanese do love children and will play endlessly with them. Even when at rest, the alert face shows the intelligence within. The Havanese humor delights us on a daily basis, and their loyalty (despite their small size) is heart-warming. They are self-aware, they are adaptable and theuy are fantastic for many different lifestyles. Our love for this breed is what fuels us to produce puppies who exceed the standard–while never losing sight of health and temperament. Our family who has been breeding AKC dogs for fifty years, you could say it’s in our blood. With three generation of dog breeders a lot of information and knowledge is just second nature. 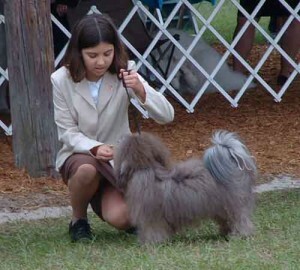 We have grown to know the ins and outs of the Havanese, helping to train and work with the top dogs in the country. Our family has been showing our AKC dogs since the early 1970’s. Kathy’s first experience at a dog show was in a stroller. We have shown many Havanese to both American and International Championships as an ‘owner handler’, often competing against professional Show Handlers. Some of our puppies have gone on to be nationally ranked in the AKC – Eukanuba National Championship. 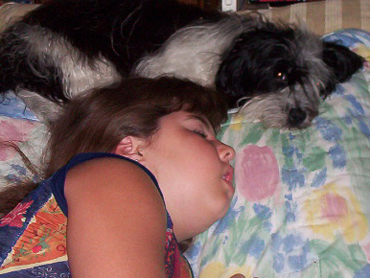 Our family’s relationship with the Havanese dates back many years. Kathy and her mother Esther are part of a family that immigrated from Cuba in the 1940’s. Esther still has fond memories of her abuelito’s family pets in Cuba which were a pair of Havanese puppies named Tito and Quetta. in 1999 we decided to revive the family relationship with the Havanese breed after the connection was brought up by Kathy while documenting the Figueroa family Cuban history. Esther’s memories, as well as her years of experience breeding and showing champions dogs, has been instrumental in this rebirth.